TEXAS BOOK LOVER: BOOK GIVEAWAY CONTEST - THE TRUTH OF ALL THINGS! OK, I said big news was coming today and here it is! In cooperation with Random House, Crown Publishers and Broadway Paperbacks, I have 3 copies of THE TRUTH OF ALL THINGS by Keiran Shields to give away. This will be a random drawing. You have one week, through midnight on Friday, May 3rd, to enter. To enter this giveaway contest, you must: 1) be a follower of TexasBookLover (I offer several ways to do this on the home page of the blog); and 2) you must leave a comment on this contest post or on the review post. 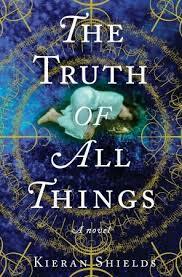 I posted a review for The Truth of All Things on April 19th and gave it a 5 of 5 rating. It is the best book I have read this year so far. Remember, the deadline is midnight, Friday, May 3rd. Please do not hesitate to send me an email with any questions. The contest is open to everyone, not just the US. I will announce the winners on Monday, May 6th. Good luck everybody! I have no idea what I am doing, but I want to read this one, so if I don't win, I will read it when you get home. It sounds like a good book to read. I read your review of this novel, and it sounds riveting. I follow as Renee G on GFC and would love to read this. That last few books that I have read have been good, but not outstanding. I'd love to read one that you think is the best you've read this year. Sounds great. I'm following via GFC (Sophie Hedley). Sounds like a great book with a very good recommendation. Thanks for the giveaway. I would like to read this book. It sounds good. Following as Ruth on GFC. I borrowed this from the library and really enjoyed it, I would love to have my own copy to re-read. This looks like an entertaining read! Your review is a great recommendation--I will look foreward to reading this book. This book sounds great. I love historical novels and I love suspense!